Paula Gray - Did You Feed Your Soul Today? 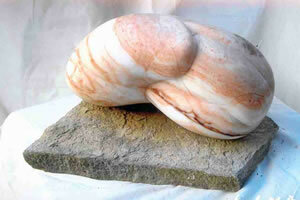 Stone carver Paula Gray discovered her fascination with sculptural form when she began working with trees and branches to craft unique furniture pieces. Shaping the flowing lines of their arms and backs nourished an artistic longing she had not recognized. When she stumbled upon Deborah Arnold's stone sculptures (September '06 issue of theHumm) during a studio tour, the attraction was visceral and irresistible. Gray had discovered her artistic calling. She impulsively asked Arnold if she would teach her how to work with stone. Ten years later, both Deborah and Paula are involved in creating a memorial to honour the lives of Lanark County women killed in situations of domestic violence. Gray’s work has evolved over the decade. Her confidence has grown with her success in studio tours both in the Ottawa Valley and in her second home in Ville de Mont-Tremblant, Québec. She has begun to “impose” her own artistic vision on some of the beautiful stones she selects, as an alternative to intuiting and revealing the organic image concealed in individual pieces. Both approaches are valid and yield strikingly different results. As someone who lives surrounded by a large collection of Inuit stone and petrified bone sculptures, I am astonished when she tells me that the sculpture I interpret as a human morphing into a whale was not intentionally carved to represent that transformation. Many pieces are obliquely sensual; all are sensuous. It is almost impossible not to stroke them. If I were a cat or dog, I would not want my human to own a Paula Gray sculpture. Throughout our history we humans have made marks. Based on the few remaining pieces of prehistoric sculpture, art historians generally agree that their principal function was not beauty; they were made to be used in rituals. In their constant fight for survival, early people created sculpture to provide spiritual support in their efforts to cope with the mysteries and overpowering forces of nature. Ancient sculptures reveal religious beliefs and the ceremonial rituals observed across cultures. On a personal level, Gray experiences new levels of self-awareness as she carves. In the process of artistic creation, she explores her relationship with her subconscious, making connections with emotional and physical memories that are unavailable on a rational level. It is a healing as well as a revealing process. Creating beauty may not be the principal function of her sculpting, but it is a most welcome result. Paula believes that society would benefit enormously if we took better care of ourselves emotionally. That includes the responsibility for discovering who we really are — we have little practice in listening to what we really want. She compares our minimal understanding of the need to feed our souls, with our once believing that the sun revolved around our flat world. For Gray, looking at art and creating art connects her with her subconscious and feeds her soul. She recommends both. Gray explored several other options before concluding that art is her passion. Her journey began in Toronto where she learned one of her many skills, from parents who taught downhill skiing in addition to pursuing professional careers. Paula too is a ski instructor. 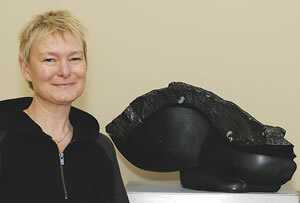 Academically, she earned a degree in Urban and Regional Planning at the University of Waterloo, followed by a Master’s in Science and Forestry at the University of Toronto. She worked for the Ontario Ministry of Natural Resources, becoming a forestry economist. When she realized that she preferred the variability of shorter term project work to the constraints of civil service, she resigned and completed a degree in Education. After teaching high school for two years in Toronto, she moved to an old farmhouse in Cedar Hill near Pakenham with her family. It was there that she enjoyed her first foray into three-dimensional art, creating and then teaching others how to make rustic twig furniture. She moved into Almonte seven years ago, where she continues to teach grade school students. When I asked her if she likes to teach she quipped, “I like to see people learn.” She also loves the connection she makes with her students. Humans make other kinds of marks as well. Ceremonies and rituals evolved to mark the transition from one phase of life or social status to another — christening and graduation ceremonies, weddings, funerals, inaugurations, and many other “life-crises” that affect the relationships of all those people closely connected with the subject of the ritual. As formal religious observance continues to diminish across North America, there has been a concomitant increase in the need for persons trained to officiate at private ceremonies and celebrations. Last year Paula became a Certified Life Cycle Celebrant, trained to develop traditional or uniquely tailored life ceremonies such as weddings and funerals. She is also active in developing rituals to mark and celebrate women’s issues. Recently she and Deborah Arnold were among artists invited to propose ideas for a memorial to honour the lives of women killed in situations of domestic violence. The project was initiated by a grass-roots group of survivors associated with Lanark County Interval House. Gray submitted a concept drawing for a memorial site; Arnold proposed a sculpture. They were asked to combine the two, and Arnold is sculpting the female figure that will be seated at a stone table in the centre of the circular meditation site designed by Gray. The project’s location is still being determined. This summer Paula will be moving from Almonte to her other home in Mont-Tremblant. To enjoy her mesmerizing sculptures and/or to discuss an upcoming celebration, you can contact her. She would be delighted to make arrangements to show her work in the Almonte area, or to host a studio visit for anyone traveling to the Mont-Tremblant area.